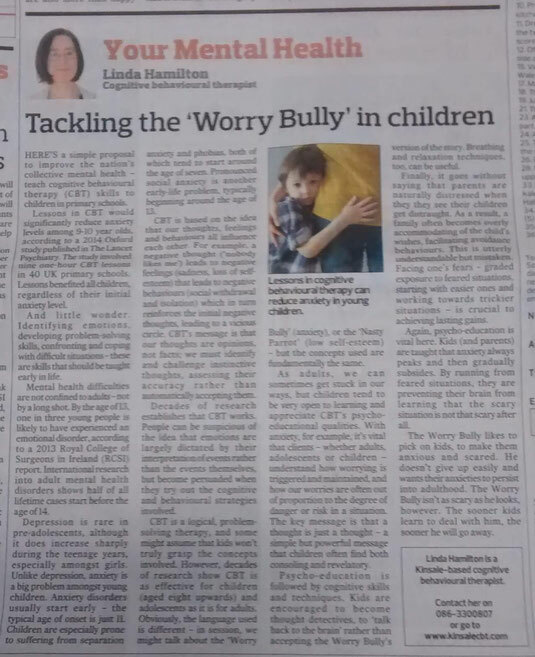 In last week's Southern Star, I explored how teaching children CBT skills helps them to deal with their anxieties. The column is reproduced below. Here’s a simple proposal to improve the nation’s collective mental health – teach cognitive behavioural therapy (CBT) skills to children in primary schools. Lessons in CBT would significantly reduce anxiety levels among 9-10 year olds, according to a 2014 Oxford study published in The Lancet Psychiatry. The study involved nine one-hour CBT lessons in 40 UK primary schools. Lessons benefited all children, regardless of their initial anxiety level. And little wonder. Identifying emotions, developing problem-solving skills, confronting and coping with difficult situations – these are skills that should be taught early in life. Mental health difficulties are not confined to adults – not by a long shot. By the age of 13, one in three young people is likely to have experienced an emotional disorder, according to a 2013 Royal College of Surgeons in Ireland (RCSI) report. International research into adult mental health disorders shows half of all lifetime cases start before the age of 14. Depression is rare in pre-adolescents, although it does increase sharply during the teenage years, especially amongst girls. Unlike depression, anxiety is a big problem amongst young children. Anxiety disorders usually start early – the typical age of onset is just 11. Children are especially prone to suffering from separation anxiety and phobias, both of which tend to start around the age of seven. Pronounced social anxiety is another early-life problem, typically beginning around the age of 13 (continued below). CBT is based on the idea that our thoughts, feelings and behaviours all influence each other. For example, a negative thought (“nobody likes me”) leads to negative feelings (sadness, loss of self-esteem) that leads to negative behaviours (social withdrawal and isolation) which in turn reinforces the initial negative thoughts, leading to a vicious circle. CBT’s message is that our thoughts are opinions, not facts; we must identify and challenge instinctive thoughts, assessing their accuracy rather than automatically accepting them. Decades of research establishes that CBT works. People can be suspicious of the idea that emotions are largely dictated by their interpretation of events rather than the events themselves, but become persuaded when they try out the cognitive and behavioural strategies involved. CBT is a logical, problem-solving therapy, and some might assume that kids won’t truly grasp the concepts involved. However, decades of research show CBT is as effective for children (aged eight upwards) and adolescents as it is for adults. Obviously, the language used is different – in session, we might talk about the “Worry Bully” (anxiety), or the “Nasty Parrot” (low self-esteem) – but the concepts used are fundamentally the same. As adults, we can sometimes get stuck in our ways, but children tend to be very open to learning and appreciate CBT’s psycho-educational qualities. With anxiety, for example, it’s vital that clients – whether adults, adolescents or children – understand how worrying is triggered and maintained, and how our worries are often out of proportion to the degree of danger or risk in a situation. The key message is that a thought is just a thought – a simple but powerful message that children often find both consoling and revelatory. Psycho-education is followed by cognitive skills and techniques. Kids are encouraged to become thought detectives, to “talk back to the brain” rather than accepting the “Worry Bully’s” version of the story. Breathing and relaxation techniques, too, can be useful. Finally, it goes without saying that parents are naturally distressed when they they see their children get distraught. As a result, a family often becomes overly accommodating of the child’s wishes, facilitating avoidance behaviours. This is utterly understandable but mistaken. Facing one’s fears – graded exposure to feared situations, starting with easier ones and working towards trickier situations – is crucial to achieving lasting gains. Again, psycho-education is vital here. Kids (and parents) are taught that anxiety always peaks and then gradually subsides. By running from feared situations, they are preventing their brain from learning that the scary situation is not that scary after all. The Worry Bully likes to pick on kids, to make them anxious and scared. He doesn’t give up easily and wants their anxieties to persist into adulthood. The Worry Bully isn’t as scary as he looks, however. The sooner kids learn to deal with him, the sooner he will go away.